November 6, 2018 by Collins & Lacy, P.C. 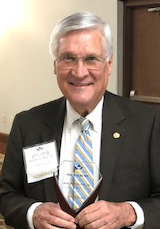 [COLUMBIA, S.C. November 6, 2018] – South Carolina Lawyers Weekly inducted Collins & Lacy co-founder Joel W. Collins, Jr. into its’ Hall of Fame at a luncheon in West Columbia on Tuesday, November 6th. This is SCLW’s inaugural Hall of Fame class. The hall honors attorneys who are aged 60 and older who have had significant impacts on the legal profession in the Palmetto State. Collins was one of 22 honorees who were profiled by the legal publication. Editors selected the class of inductees based on career accomplishments, contributions to the development of the law, and efforts to increase access to justice. Service to others has been at the heart of Collins’ 50+ year career, from his role as a JAG in the Army during Vietnam, to representing businesses and professionals in complex litigation, and teaching honors students at the University of South Carolina. His Lawyers Weekly profile included a fun anecdote about service as a young boy growing up in Chester, South Carolina. In 1984, he co-founded Collins & Lacy law firm along with Stan E. Lacy. Over the course of 50 years, the accolades have been numerous. Earlier this year, Collins received the Order of Palmetto, the state’s highest civilian honor. However, it is service that makes Collins proud. He told Lawyers Weekly that his proudest professional accomplishments involve serving the American Board of Trial Advocates (ABOTA) where he has been a foundation trustee, president of the foundation trustees, and national president of ABOTA. About Collins & Lacy, P.C. Collins & Lacy is a statewide business defense firm in South Carolina relentlessly focused on the client experience by delivering unwavering legal representation through solid preparation, consistent execution, and client-oriented service aimed at success. With offices in Columbia and Myrtle Beach, the firm represents local, regional and national clients in the areas of construction, corporate and business law, retail/hospitality, insurance/bad faith, products liability, professional liability, commercial transportation, and workers’ compensation.